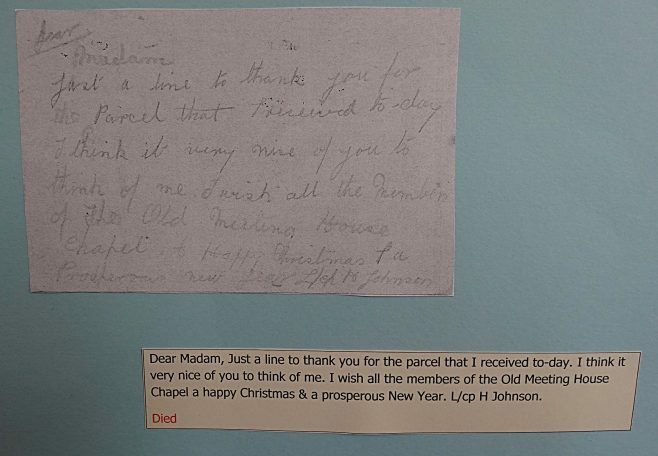 Members of the Old Meeting House in Mansfield have been tracing where the 22 members of their congregation who lost their lives in WW1 are buried or commemorated. Twenty one have been discovered in France, Belgium, Baghdad and Mansfield, however despite all efforts, one person H. Johnson is still to be found. These pictures were part of a Heritage Display in the Church Hall on Saturday 13 September 2014. 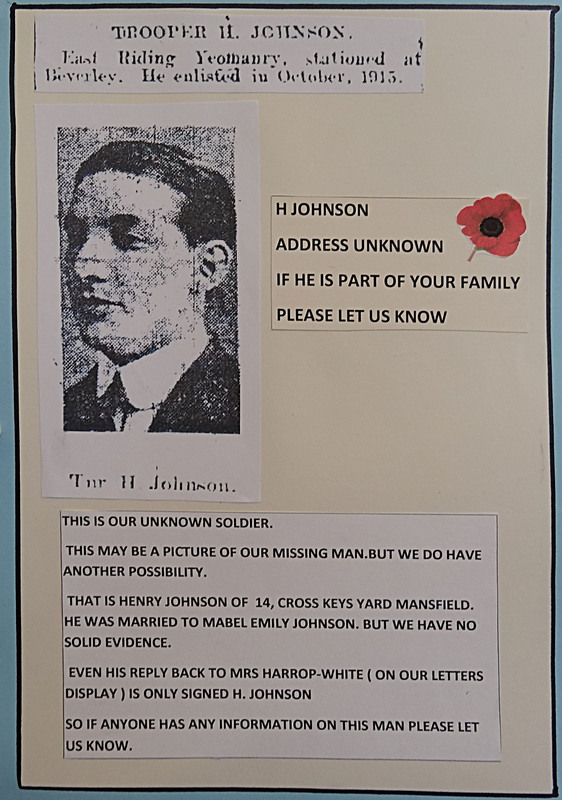 Members of the church have placed poppy crosses at all the resting or commemoration places of the other 21 members, they have one cross left for H Johnson, can you help trace him? Can I add my great grand father to this page , missing during WW1? Thomas Wilson from York St. Mansfield Woodhouse . Thomas Wilson 28204 11th battalion Sherwood Foresters . Mentioned on the war memorial in Carr Bank Mansfield Woodhouse and the Thiepval memorial in Belgium . Missing in action after an attack in Fleurs trench, the Somme . I have a member of the Kings Own Yorkshire Light Infantry in my own family who was sent from the Reserve battalion, stationed at Clipstone, to France in August 1916. Hope that helps. Hi Kevin, Glad you remember me, where have all the years gone? I cant remember you being that interested in Mr Burgess’s history lessons but looks like you have got quite a hobby now! Hi guys thanks for all your help, it seems our missing man is causing quite a lot of interest! We are at the moment looking back into to chapel records to see if we can trace his family, we may have found a relation that lived at 58 Mount Street, we think ”H’s” fathers name was Hendry of 74 Gladstone Street but the search goes on. Hi Paul, I did go to St Johns and I do remember you. My research started a few years ago when I went to France to visit my Great Uncles grave in France, I have been over once a year since then, hopefully I will be going again this year. I do not think that Henry Johnson from Mansfield is the man in the photo. I think I have identified him as Corporal Henry Bowman Johnson service number 235663, Kings Own Yorkshire Light Infantry (formerly East Riding Yeomanry) died on the 26th March 1918 aged 37. He was the husband of Hannah Johnson of Bridlington, Yorkshire. He is buried in Caberet-Rouge British Cemetery, Souchez, 3.5 km north of Arras. Grave number XVI. F. 33. Regarding H. Johnson, I do not believe this photo is of Henry Bowman Johnson. I specialise in KOYLI soldiers, having worked at the regimental museum and having researched soldiers for almost 12 years. Henry Bowman Johnson has no connection with Mansfield as far as I know. He was born in Hull, enlisted with the KOYLI in Hull and was living in Hardy St, Kingston upon Hull at the time of his death. The photo that Peter from the OMH has shown was supplied by myself taken from a Mansfield newspaper and so more likely to be a resident of Mansfield/Ashfield area. I think that the missing soldier is more likely to be H Johnson that lived in Cross Keys yard. Private Henry Johnson service number 71444 15th Battalion Sherwood Foresters (Notts and Derbys Regiment) died on the 28th March 1918. He has no known grave and is commemorated on the Pozieres Memorial, Somme, France. Henry was the son of Fredrick and Maria Johnson, of Bottesford, Notts; husband of Mabel Emily Johnson, of 14, Cross Keys Yard, Mansfield, Notts. On 21st March 1918 the German Army launched their spring offensive named Operation Michael, as Henry died on the 28th March he would have been involved in this battle. How Beautiful Mansfield Was in my Time.. The Old Saint Aidans Church.